While skunks may seem like friendly animals (especially if you have grown up around domestic animals, you may think it’s no big deal), it’s important to remember that a skunk is a wild animal. Wild animals don’t usually react positively to unnecessary contact, especially if you aren’t really sure what you are doing. If you handle a skunk yourself, it’s possible that you will be subject to bites and scratches. Skunks have sharp teeth and claws that they use to dig through the soil. 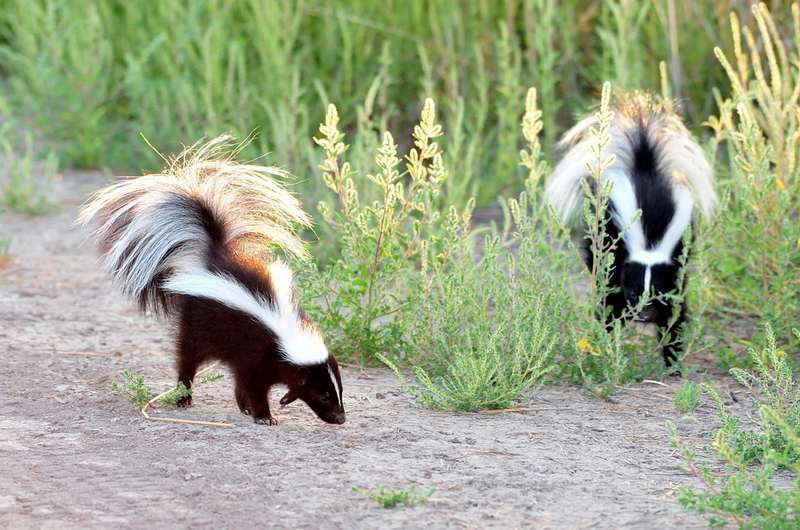 Skunks also carry a number of diseases, like rabies, which you could be exposed to if the skunk bites you. In addition to rabies, skunks can carry Leptospirosis and Baylisascaris columnaris (roundworms). A skunk’s spray is another reason why you would want to stay away and leave it to the professionals. It can spray up to 10 meters. Getting rid of a skunk smell isn’t easy and it can last for a while. Like yourself, skunks can also be dangerous to your pets. As mentioned before, if they feel threatened they can attack, and your pets can suffer the consequences. If a pet is sprayed by a skunk, it can cause toxic shock syndrome because the skunk’s spray can attack the pet’s healthy red blood cells. This can then lead to seizures and anemia. As discussed skunks are also infamous for carrying the rabies virus. If your pet contracts the rabies virus, it can be fatal to the animal itself and others in contact with the pet. Skunks are also known to carry other diseases harmful to pets, including canine hepatitis. They also carry fleas, ticks, and mites that can cause serious issues for your furry friend. Just because you shouldn’t handle a skunk by yourself does not mean that you should leave them on your property. The right animal control company can help remove the skunks from your property and keep you safe in the process. Without proper trapping, skunks can be harmed and/or keep coming back. If you want skunks gone for good, work with a trusted professional. Contact Animal Capture Wildlife Control for humane skunk removal service.